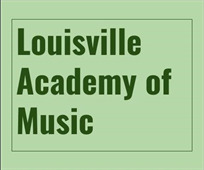 Welcome to The Louisville Academy of Music! Please complete the following registration form. The lesson time assigned to each pupil is a standing appointment. Because the lesson period is a reserved time, there is a charge for that period if the student is absent. At the teacher's discretion, unavoidable absences may be made up when possible. Students should arrange make-up lessons directly with the teacher. Make-up lessons are those in addition to regular lessons, not in place of them. During the summer, make-up lessons for absences during the school year may not be taken in place of regular lessons. Lessons cancelled by teachers will not be charged for and do not have to be made up. During the summer, students are not charged for lessons when they are out of town, and they do not have to make up the missed lessons if you submit your vacation notice to the teacher at least a week prior to the absence. Students who need to miss lessons for more than two weeks due to illness should request a leave of absence and no charge will be made for this period. Student fees will be posted monthly for the number of lessons in that month. The due date will be before the 15th of each month. A late fee of $1.00 per day will be charged after that due date. Music, supplies, and any adjustments will also be posted to your account. Students who fail to meet their financial obligations will be dropped. Lessons at LAM are "at will," meaning that either you or the teacher may stop lessons at any time and for any reason, with or without cause. In consideration of the benefits derived from lessons at the Louisville Academy of Music (LAM) , I do hereby agree to indemnify and hold harmless, release, and discharge LAM and its staff and independent contractors from any and all claims of personal injuries or property loss or damages sustained by me/my child while participating in activities with LAM and its staff. I agree to read and abide by all policies stated by LAM. If inclement weather forces us to close, we will post a notice on social media. You will be notified personally if your teacher finds it necessary to cancel a lesson. LAM will close in observation of Labor Day, Thanksgiving Day, Christmas, New Year's Day, MLK Day, Memorial Day, and Independence Day. LAM does not close for any spring vacation. I, for myself as an adult student or as the parent/guardian of minor student(s), do hereby grant permission to The Louisville Academy of Music (LAM) to use my or my child's photos or videos taken at LAM or LAM events. I give permission to LAM to use media materials with me or my child for website, print, and social media platforms in order to promote my or my child's progress as a student and/or further the mission of LAM. I hereby release LAM from all claims and demands arising out of or in connection with any use of photos or videos, including, without limitation, all claims for invasion of privacy, infringement of my right of publicity, defamation and any other personal and/or property rights. I acknowledge that my child is under 18 years old and lacks the legal capacity to enter into binding agreements. Accordingly, I have read this Release and consent to my child's inclusion in media release of photos or videos. If you do not wish to grant this use, please note this in the comment section below.